You have to earn your spurs to last in the motorhome market. 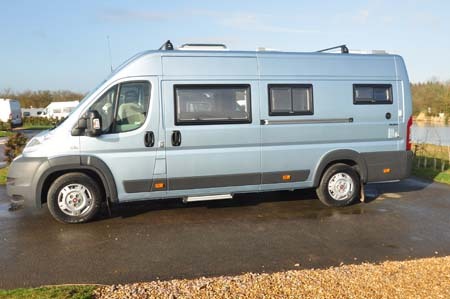 That’s something Devon-based Murvi has certainly achieved in over 30 years of upmarket van conversions with a genuine sense of individuality. It has always sold direct, retaining an independent stance yet gaining universal appeal, respect and indeed accolades for its conversions. Such is the nature of Murvi’s work, although it doesn’t build bespoke, each vehicle is still specialist enough to warrant Individual Type Approval. It’s happy to make tweaks to its designs, of course, and there’s an extensive choice of upholsteries, with quite a few complementary colours for the distinctive locker doors (see the pictures). They certainly complement the light blue metallic paintwork here, one of a huge number of options offered by Murvi. Only a few are listed in our summary below, but they’re the options which feature on this example. Although the exterior remains largely discreet, it’s inside that Murvi pushes its advantages. If you’ve seen the standard Morocco (and indeed, the even more popular Morello) you’ll know that the superb, high-backed settee possibly tops the list of its most attractive features. 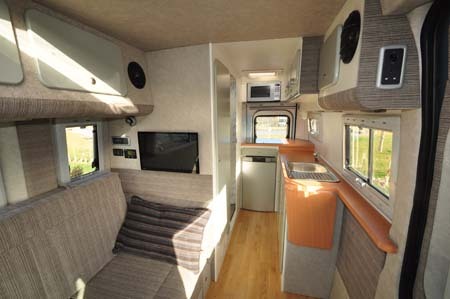 It’s all geared towards optimum comfort and the ability to just take in the views around you when you open the sliding side door. Just as important is the huge amount of floorspace it allows – that’s something you only really appreciate when you’re on site. It also makes the Morocco much more “pet-friendly” than so many other similar vehicles. 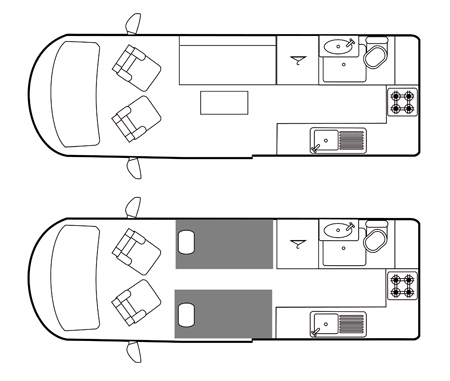 As for mealtimes, there’s a free-standing table, or a smaller, dog-leg table for the swivelled cab seats. At night, that settee converts to single beds – 1.93m x 0.84m (on the offside) and 1.85m x 0.69m (nearside) – or you can keep it as a double, at 1.93m x 1.52m. 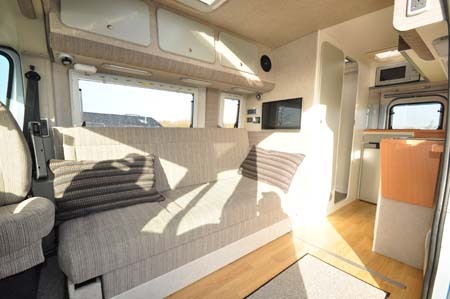 The kitchen, stretching across half of the back and around the nearside, is equally spacious, offering far more worktop space than you’ll get in many a motorhome. 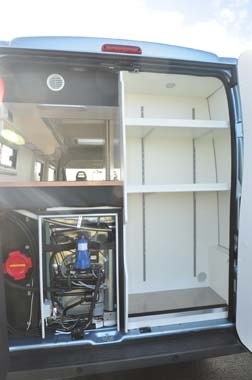 Here, Murvi offers a number of choices for the cooking/refrigerating configuration. It’s a dual-fuel hob (an extra £60) and a 90-litre fridge, plus microwave oven and grill (£264), but alternatives include: a 60-litre fridge under an oven/grill, plus four-ring gas hob; or a compressor fridge; or a three-burner hob, 90-litre fridge and oven. Or you can go “gas-free” with a ceramic hob. It’s up to you. In the rear offside corner is the washroom. 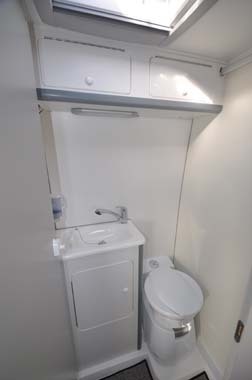 It’s the usual Murvi offering – all lined, with Murvi’s own shower tray and sink mouldings and an upmarket ceramic swivel-bowl toilet. Useful fittings also extend to a shower curtain rail that’s sturdy enough to hang other items from. 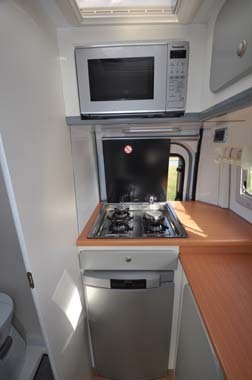 Open the rear doors and, as well as the usual maintenance access to the back of the fridge, cooker etc on the nearside, the offside has a separate floor-to-ceiling, lined storage area. Again, depending on your needs, the configuration in here is up to you – the shelves here, for example can be adjusted for height, or removed altogether. Everything else has been well thought through. There’s an underfloor 25-litre gas tank (saving both space and the cost of replenishing your LPG supply), while heating and hot water are via a superior Webasto system using diesel or mains electricity. 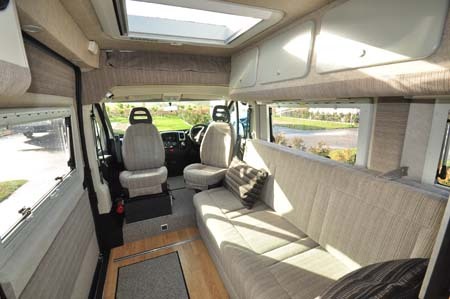 Other key standard features are too many to mention, but include everything from the safe in the passenger’s seat base to two Banner leisure batteries, CTEK battery charger, special insulation throughout, semi-rigid plumbing etc etc. As you can see, we put going to Devon to make your purchase as the main minus point here. If that’s a minus, consider it an indication of how seriously good Murvi makes ‘em! 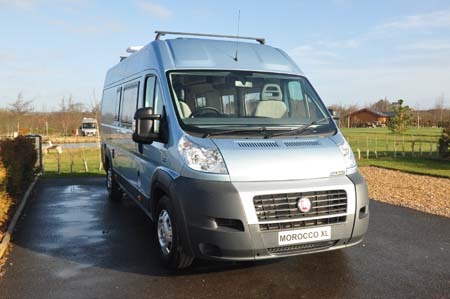 There’s more information on the Morocco XL on the Murvi website and to find out more about our low-cost premiums visit the motorhome insurance discounts page.